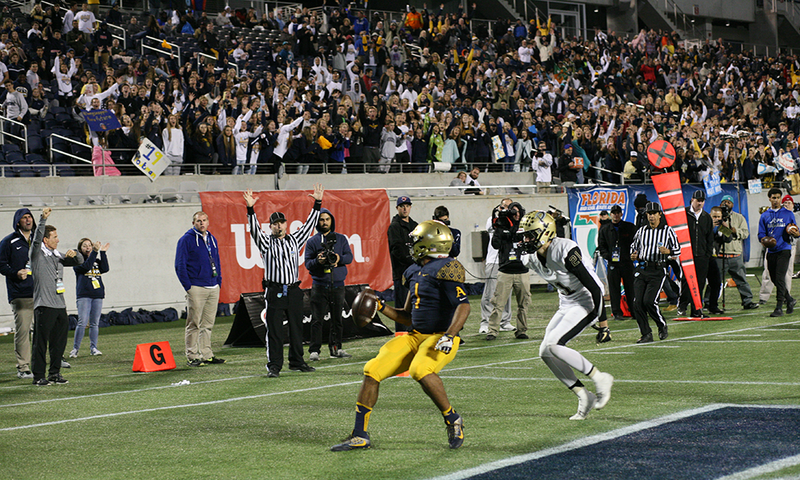 ORLANDO, Fla. — A total one-sided mismatch was the result on Friday night for the St. Thomas Aquinas Raiders as they ran away with a 45-6 victory over the Plant Panthers in the 2016 FHSAA Class 7A State Championship at Camping World Stadium in Orlando. The win gave the Raiders their third straight championship victory. During the first quarter, it seemed that Plant (13-1) might have the tempo and power to be able to keep the Class 7A power in check and not let them run away with the game as they forced the Raiders to punt on the first drive of the game. However, that tempo and power didn’t last very long as Plant did grind out some play on the first drive of the game but quarterback Dane Frantzen found it wasn’t going to be easy as he was intercepted easily by Adetutu Daranijo at the Raiders 13. It only took seven plays on the second drive for St. Thomas Aquinas (12-2) to cash in on the turnover as current Florida Gator commit quarterback Jake Allen found Michael Harley for a 24-yard touchdown reception with 5:14 to go in the first quarter. Harley was a favorite target all night for Allen, connecting on five receptions for 133 yards and three touchdowns. Plant saw their second drive go up in smokes as they tried to go for it on a fourth down from their own 35, but a fumble gave the Raiders the ball back with the Raiders capitalize quickly on one play with an Allen pass to Joshua Palmer for 28 yards to extend the lead 14-0. It would take St. Thomas Aquinas getting up 21-0 before Plant would finally respond with the help of a Frantzen pass to Whop Philyor for 50-yards that set up a Frantzen 1-yard touchdown run a few plays later to cut the score to 21-6. That might have fired up the Raiders even more as they wanted no part of possible Plant comeback in the second half as the Raiders tacked on a 22-yard field goal and an Allen pass to Jordan Merrell to take a 31-6 lead into the half. In the second half, the path towards a running clock continued as the Raiders poured it on with another Allen pass to Harley, this time from 10-yards to make the score 38-6. Allen would also find Harley again for a 62-yard pass as the third quarter came to a close to make the score 45-6, triggering the running clock as neither team would score again for the rest of the game. Allen finished the night 17 of 29 for 329 yards and five touchdowns through the air with only one interception, putting on a clinic for Florida Head Coach Jim McElwain and Florida offensive coordinator Doug Nussmeier who were both in attendance at the game to see Allen in action. The win for St. Thomas Aquinas puts them in second place for the most state championships by any one school with 10. Bolles leads the state with 11 state championships overall, a record that the Raiders possibly hope to tie next year.